Mother Nature showed her fickle side this week as Friedman Memorial Airport geared up to reopen after a nearly problem-free, monthlong closure to rebuild the airport's single runway. Cold weather and the threat of snow are "going to make it a challenge" to finish work and reopen as scheduled at 7 p.m. tonight, Wednesday, May 23, Airport Manager Rick Baird said. Weather had been ideal until the final hours of the project. 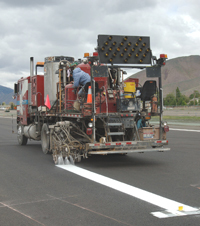 The final touch is striping and painting the new runway, required by the Federal Aviation Administration as part of safety standards. This includes applying large numerals 31 at the southerly end of the runway and 13 at the northern end, indicating the runway's compass headings (310 degrees and 130 degrees), plus stripes to indicate to pilots the threshold of the runway and touchdown areas. By Monday afternoon, Baird said contractors were racing against the clock and the weather to complete the striping and painting. Otherwise, he said, only one hitch developed during the project, which began April 24—old, moist material resembling clay had to be removed and replaced with a gravel-like material, adding $50,000 to the multi-million-dollar project. Baird said the only alternative was to leave the moist layer exposed for a month to dry out, which he said was not a reasonable choice. FAA design standards for runways, Baird said, have changed over the years, which accounts for the types of materials encountered during the reconstruction. Asked whether workers discovered any archaeological artifacts, Baird said, tongue firmly in cheek, that no dinosaur bones were found.